← WIP Wednesday: Sock Madness! The fibre sandwich is a great idea for using up small amounts of fibre. 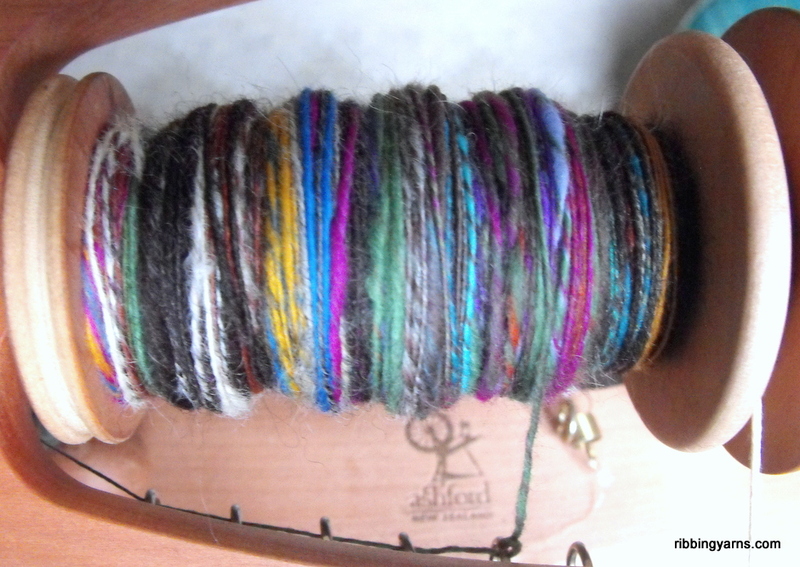 You need at least one spinning-mad friend to make it fun and interesting, though :) Each spinner just needs to bring along a small amount of fibre (25-50g), ideally in a selection of colours. 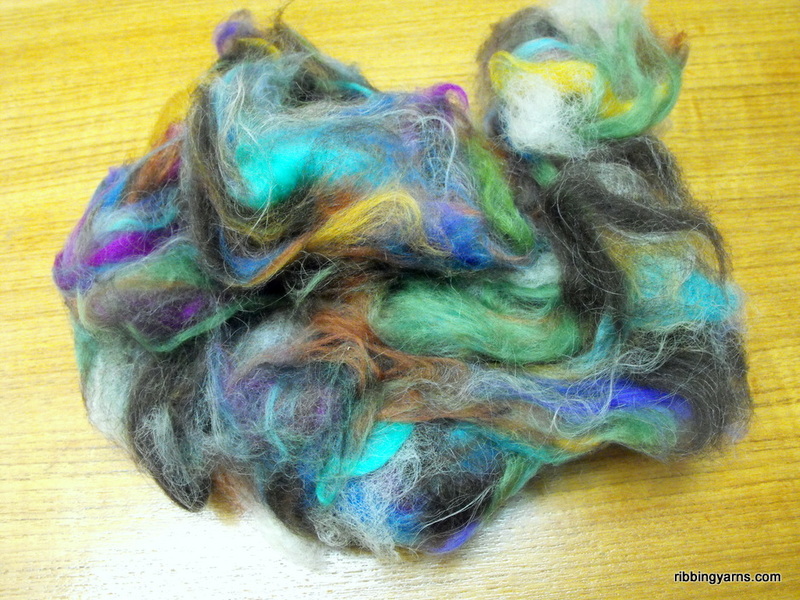 You can also mix fibres to create an interesting combination of textures in your finished yarn. Just keep building up those layers! 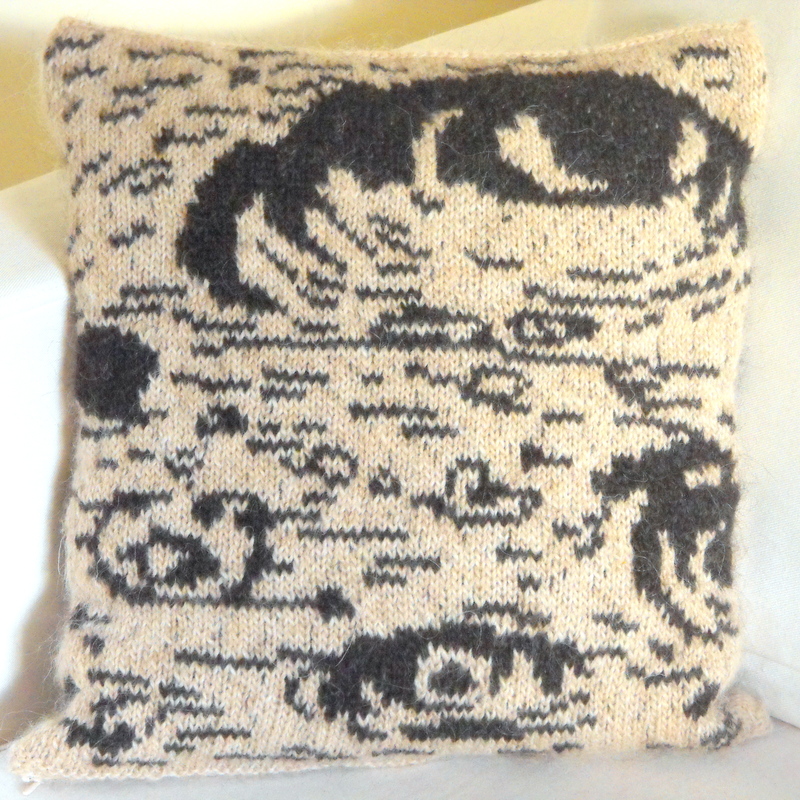 At some point it will look a bit high and fluffed up- just squish it down a bit and add more. Here’s the team hard at work. 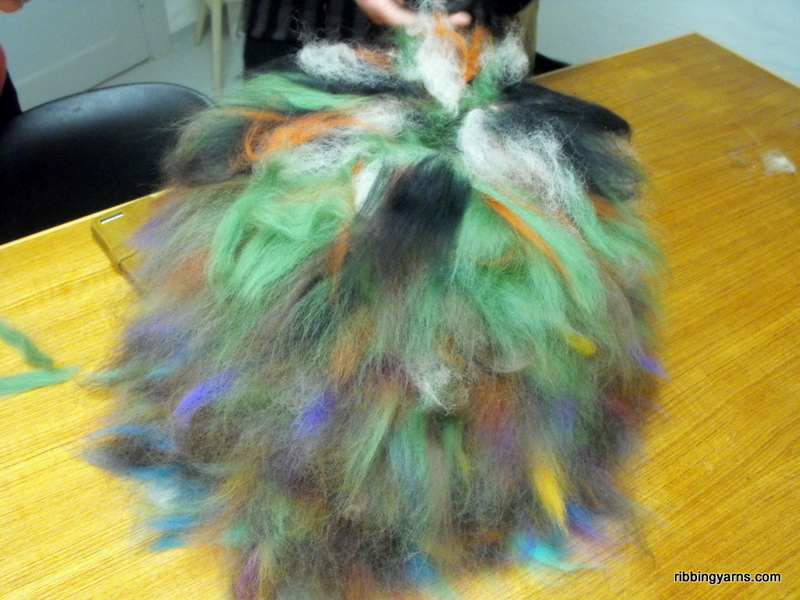 Keep going until all your fibre is used up, and you have something approximating a Sesame Street monster sitting on your table top. Divide the sandwich! You’ll probably need a scale for this. Divide the whole thing down the middle like a sandwich and give each team member an equal wedge. Here’s my slice. I took my slice of wooly sandwich home- there were lots of ingredients in there! As far as I can remember we had: merino tops, ultra soft New Zealand wool (gifted by Bev), Jacobs, natural Icelandic, and probably more! Some of it was soft, some was hairy, and some was still “in the grease”. What would it be like to spin with? Hey presto! I have no idea what I’m going to do with it (it’s about 50g) but the last part of the game involves knitting something with it! I think it’s crying out to be made into something a bit mad..but what? A single eccentric glove? Mini arm warmers? Let me know your suggestions if you have some! 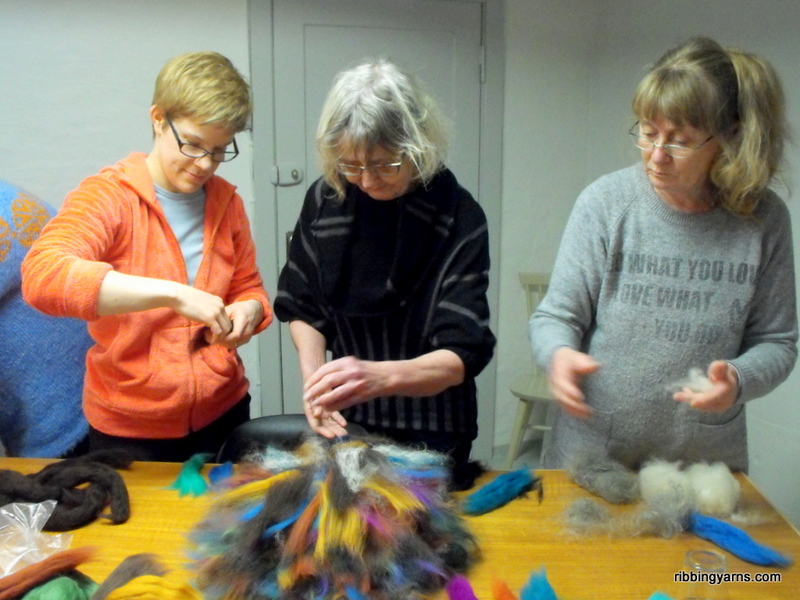 This entry was posted in How To, Spinning and tagged Copenhagen, Craft, Danske Spindere, Fibre Sandwich, København, Knitting, New Zealand Hermit Sheep, Ravelry, Spinding, Spinning, Spinning Game, Spinning Guild, Strik. Bookmark the permalink. 5 Responses to How to: The “Fibre Sandwich” Game! 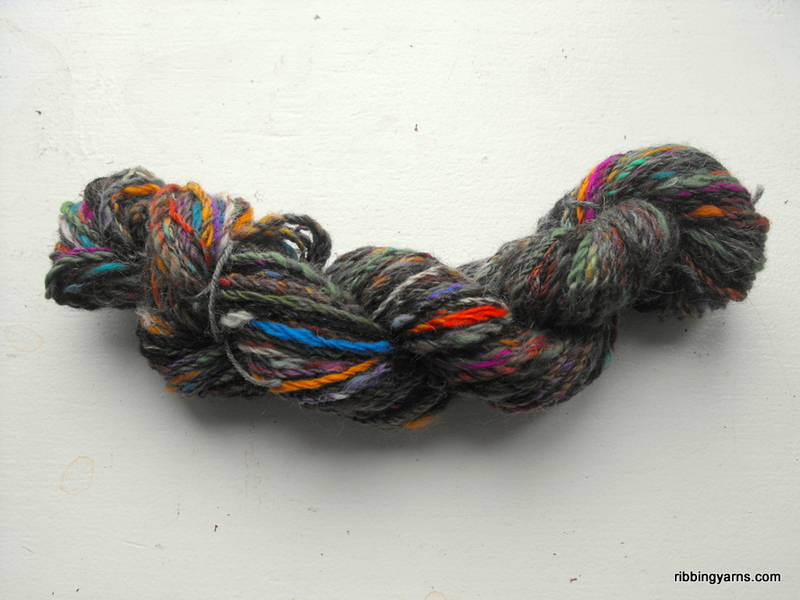 You could make a hat or shawl and use this yarn as a few embellishment rows to add interest.